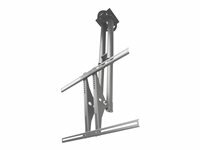 Ceiling mount for LCD / plasma panel, silver, screen size: 37"-75"
The NewStar PLASMA-C100 ceiling mount allows you to mount a LCD, LED or Plasma screen to a ceiling. With this mount you can lift and tilt the screen for maximum efficiency and comfort. This ceiling mount is universal and can be used with screens between 32-60" and a maximum VESA hole pattern 800x450 mm. The carrying weight is 50 kg. Colour: silver. The height of the flatscreen can be adjusted between 64-104 cm. If you need a larger height you can use the optional extension poles. These are available in the following lengths: 100, 150, 200 & 250 cm. For model PLASMA-C100 you need 2 extension poles.